workshop, where you see some of these clay creations. Overnight at your hotel. preserved classical city in the eastern Mediterranean. Visit the site of the Temple of Diana, considered one of the Seven Wonders of the Ancient World. 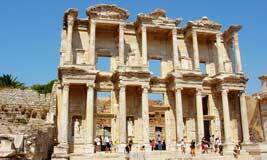 Continue to the theater, Library of Celsus, the Public Baths, Arcadian Way and the Marble Street. You have the opportunity to privately visit the breathtaking Terrace Houses. Ephesus, accompanied by a quintet from the Izmir Symphony Orchestra.